The worst part for the Black Caps isn't the losing. No, the worst part of their now three straight defeats to India is the fact that they haven't even got close. A seven-wicket defeat in the third ODI has sealed a series defeat with two games remaining, as India once again utterly dominated New Zealand in all facets at Bay Oval. This was the best effort so far from the Black Caps as well, and yet, it was still nowhere near good enough as Rohit Sharma (62) and Virat Kohli (60) led a successful chase of 244 - another below-par target. It's now three losses in a row for the Black Caps - the first time they've lost three consecutive ODIs at home since 2013, and the first instance of losing three straight in an individual home series since March 2012. You have to go all the way back to 2005 to find a home losing streak of four or more, and at this rate, you'd be brave to predict anything else. Sure, Kohli is sitting out the rest of the tour after today's contribution, and India will experiment with their lineups, but they possess plenty of depth, and the Black Caps have been thoroughly outplayed in all three matches. At least this time there were positives to take from the game. Ross Taylor was back to his classy best with 93, and for the first time this series the Black Caps built a significant partnership as he added 119 for the fourth wicket with Tom Latham. Unfortunately for the hosts, it was the only decent partnership of the innings, and was also extremely necessary after the pair touched gloves for the first time at 59-3. 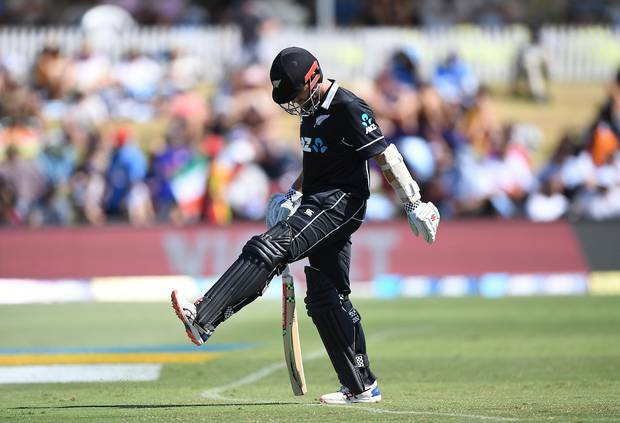 Once again, Martin Guptill (13) and Colin Munro (7) failed to deliver at the top of the order, and Kane Williamson's attempted rebuild was cut short on 28 by a stellar catch at short mid-wicket from returning all-rounder Hardik Pandya. Pandya ended with 2-45 with the ball, Mohammed Shami took 3-41 and Bhuvneshwar Kumar 2-46, as the seamers stepped up after the Black Caps did a much better job at negating India's spinners. Taylor and Latham, two of New Zealand's best exponents at playing spin, looked excellent after their somewhat scoreboard-enforced slow start. 70 balls went by without a boundary as Taylor struggled to tick the strike over early on, but he picked it up as he progressed, especially efficient through the off-side as he eventually compiled 93 from 106 balls. Latham was in fine form in getting through to 51 from 64 deliveries, but with 12 overs to go he perished trying to up the run rate. Starting slow can always be a high-risk strategy, and when the middle order couldn't deliver any cameos, New Zealand had slumped from 178-3 to 243 all out. While they had hope of victory on a slower, recently used pitch, they were probably still at least 30 runs short of a par score, and with the form they're in, India could probably chase down 350 if required. Trent Boult removed Shikhar Dhawan in the ninth over as part of an excellent 2-40, but that only brought Kohli to the crease, and he and Sharma added 113 to make the chase comfortable for the visitors. Mitchell Santner eventually had Sharma stumped with some deft flight, and Boult removed Kohli with a slower ball sent flying to Henry Nicholls at extra cover, who took a sharp catch above his head. But, India are more than just their top order, and any potential wobbles were casually steadied by Ambati Rayudu (40 not out) and Dinesh Karthik (38 not out), who sealed the win, and the series.